Maxon motor AG specializes in the development, manufacturing and sales of high quality drive components and systems under the trade mark maxon motor. All key components are manufactured in-house with custom design machinery. Our most important key technologies are three winding processes, motor manufacture and gearhead production as well as electronics, magnetic encoder components and the application of high-tech ceramics. Maxon's compact drives feature controllers, sensors and motors in a modern aluminum casing. The use of existing maxon products with an adapted design results in robust, space-saving drive solutions with high power density. The decentralised concept of these intelligent drives minimizes the use of centralized controllers. 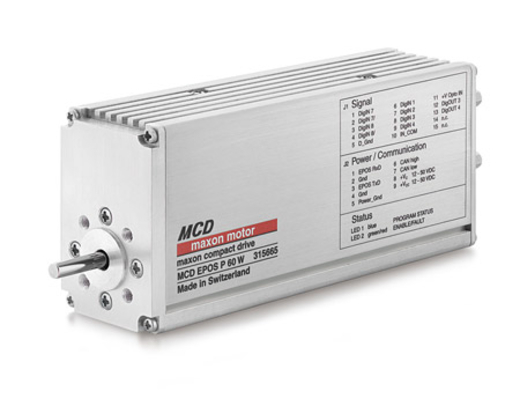 The combination of the brushless DC motor (maxon EC motor), digital MR encoder and the fully digital EPOS P positioning controller results in a highly dynamic, maintenance-free positioning drive with excellent functionality and high efficiency. The MCD EPOS P is equipped with a processor and memory for standalone operation. Up to 127 further CANopen devices can be controlled by the device. Planetary gearheads can be selected from the maxon gear pro-gramme as an option for greater torque. The MCD EPOS P is fitted with several opto-coupled inputs and outputs. Sensor signals and events can be evaluated directly in the drive. Cable lengths are shorter, thus reducing susceptibility to interference. Drive programming complies with the IEC 61131-3 standard using the powerful "EPOS Studio" tool. The integration of the motion control library reduces program complexity and development costs.